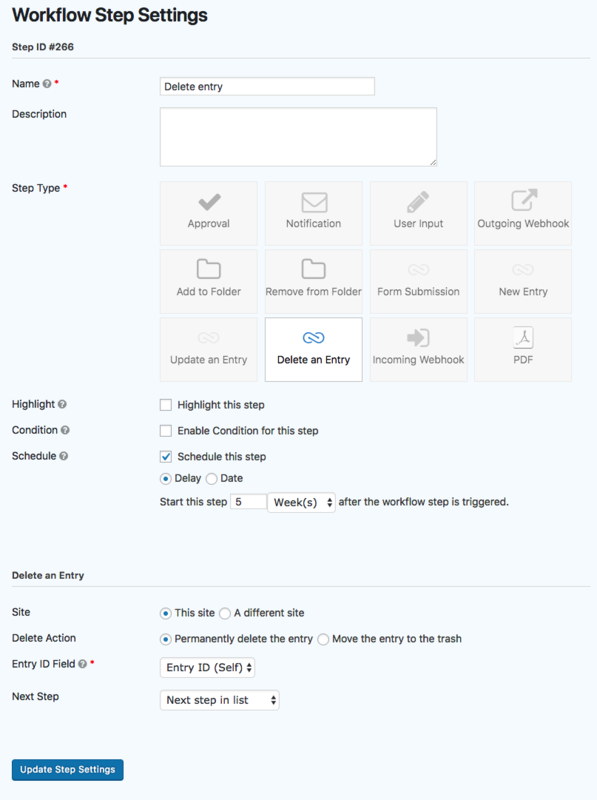 The "Delete an Entry" step is included in the Form Connector Extension can be used to trash or delete an entry permanently at any point in the workflow. It can delete entries on the current site or on a different site. This is especially useful for compliance with privacy regulations where organisations need to ensure that personal data is stored for no longer than is necessary. The Delete Entry step can be scheduled so that runs at a date in the future either specified in a date field or in the step settings or it can be delayed by any amount of time as required by your data privacy policies. The following example will delete the current entry permanently 5 weeks after the step has been triggered in the workflow. Note that the entry will be deleted only when the workflow is complete. Allow at least 15 minutes for the entry to be deleted. If you would like to delete a different entry, simply select the field in the "Entry ID Field" setting which contains the ID of the entry that you wish to delete.